It’s not uncommon for Pitbull owners to surrender a brand new toy to their pet, only to realize it was not one of the best toys for Pitbulls. They have to take it away a scant few minutes or hours later as chunks are falling off, innards exposed, pieces are eaten or missing. Many Pitbull owners are left wondering, are there actually any indestructible dog toys for Pitbulls? The truth is no. The harsh reality is there is no such thing as a truly indestructible dog toy. With enough determination and time, any toy will eventually fail. Pet owners must be vigilant when it comes to toys and playtime with their pups. Supervision is essential for the health and safety of our canine companions. However, this does not mean that there are no options for people seeking the best toys for Pitbulls, holding up to the powerful jaws of their furry friends. Why Does a Pitbull Benefit From Toys? For all dogs, chewing is a deeply embedded instinct, passed on from their wolf ancestors. Chewing benefits dogs because it allows them to exercise and strengthen their jaws. In addition, it keeps their teeth clean and healthy. Chew toys are essential for helping Pitbull puppies develop a healthy jaw and teeth. But you should give your teething puppy special chew toys to alleviate the discomfort and assist the correct formation of new adult teeth. As many pet owners know, if you don’t supply your dog with something safe to chew on, they’ll find something on their own—shoes, couches, even walls. Pitbulls are a large, classically muscular, and powerful breed and have definitely earned their reputation of avid power chewers. This makes finding the best pitbull chew toy even more important. What Are The Best Toys For Pitbulls? When it comes to Pitbull toys, we know the toy must be durable and as indestructible as possible. Luckily, there are plenty of options. Importantly, different kinds of toys do different things for your dog. This includes straight-up chew toys, treat dispensing toys, and tugging toys. Each type has benefits and drawbacks as a dog toy for Pitbulls. Typically, Pitbull owners look for toys that are durable, tough, safe, and not too expensive. So, we’ve constructed a list of some of the toughest, most durable, and the best dog toys for Pitbulls from the top brands. GoughNuts is a chew toy brand based out of Modesto, California. They make virtually indestructible Pitbull chew toys with built-in safety indicators for pet owners. Basically, the inner red core of each toy allows pet owners to visually see when a toy has been chewed through or compromised. GoughNuts holds safety high on their list of priorities. As the website states, they design toys for supervised chewing and playing. Lastly, but not least, is their replacement guarantee. GoughNuts promises to replace any toy that is damaged enough that the red indicator core is showing. To get a free replacement, you simply post the damaged toy along with a cheque to cover the return shipping fees. GoughNuts has several toy choices in a variety of sizes. 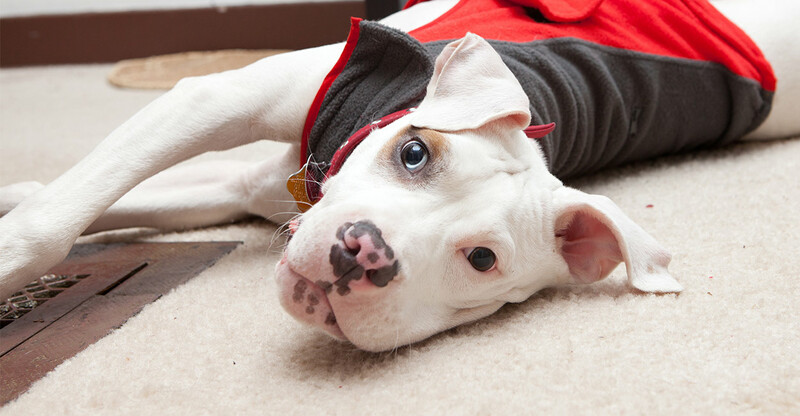 Here are a few of the most popular toys considered the best toys for Pitbulls. The original GoughNuts chew ring is now in several colors while still rocking the inner red core, it is a must-have for many Pitbull owners. 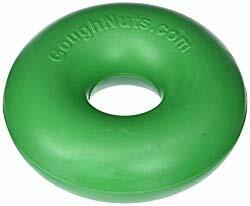 Designed by mechanical and polymer engineers, the GoughNuts original ring is a classic chew toy for Pitbulls that can stand up to even the toughest chewers. Weighing in at 1.5 pounds, this extremely tough chew stick is the same reliable GoughNuts toy in a different shape. 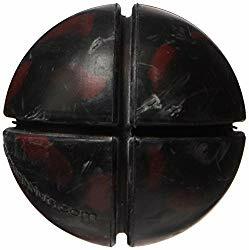 Almost a full 12 inches long and a good 2 inches in diameter, this is a chew toy well suited for larger breeds and arguably one of the best toys for Pitbulls. Almost 3 inches in diameter, this Goughnuts ball is designed to be the perfect toy for both teething puppies and playful adults. This toy comes in several cool colors and boasts the same red safety indicator core. Plus, it’s a bit more play time than chew time than other GoughNuts products. 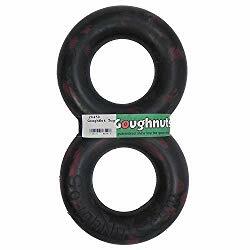 Great for tugging, tossing, or just plain play, this Goughnuts double ring tug toy had both safety and fun in mind. This interactive tug toy is 11 inches long and 6 inches wide, with a 1.5-inch cross-section. It is specifically designed for larger dogs like Pitbulls. Unlike other GoughNuts products, this toy doesn’t have a safety core. But there’s a red mark on the outside as a reminder. Mammoth has been a producer of premium dog toys since 1995. Their products catalog is impressive and extensive, giving dog owners a broad spectrum of options. Here are some of their products that we think are the best indestructible Pitbull toys. This 25-inch long, cotton blend rope tug toy comes in several different sizes, so be sure you select the size best suited for your Pitbull! Rope tug toys are among the best toys for Pitbull puppies and adults alike. Tough and durable, these toys encourage interactive play with your canine. The rope fibers help keep teeth clean and jaws strong! 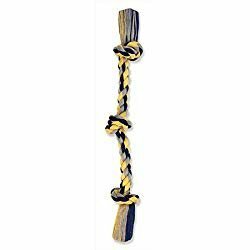 Our second durable rope toy from Mammoth the SnakeBiter not only comes in multiple sizes but four fun animal shapes. You can choose between a snake, iguana, scorpion, or spider for your furry friend to play, tug, and chew on. When it comes to Pitbull tug toys, this is one of the better options. Nylabone has been making chew toys for dogs since 1955 and can be considered the makers of some of the best Pitbull toys. The family founded company makes safe, healthy, and fun toys for many pets. They are known for dental treats and chew toys. Nylabone has several awesome products that undoubtedly make great chew toys for Pitbulls. Made in the USA, this long-lasting chew toy is chicken flavored all the way through, so your pooch won’t lose interest. Constructed from durable nylon, this toy helps control plaque, keep doggie teeth clean, and discourages destructive chewing. 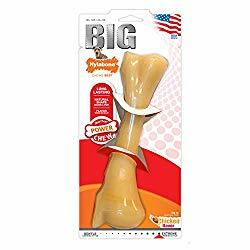 One of their larger products, this monster bone is designed with big dogs of 50 pounds and up and strong chewers in mind. 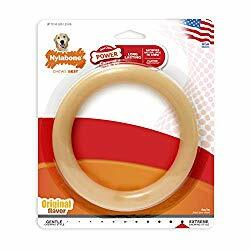 Available in a smooth or textured, the Nylabone DuraChew Ring is a great choice if you are looking for a Pitbull proof toy. Delectably chicken flavored all the way through, this is the product to keep your pup occupied. The nylon material will hold up to even the most aggressive chewers. Next up, the NylaBone-DuraChew Double Bone. A fun variation of the Nylabone line, this chew toy still has the classic Nylabone features we know and love. The durable nylon construction is long lasting, helps keep teeth clean, and provides a great source of entertainment for your pooch. 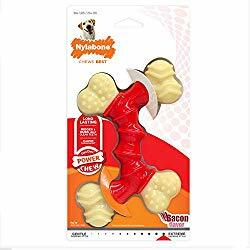 The bacon flavor is sure to keep your Pitbull occupied, while the unique shape gives your pup plenty of space to chew and enjoy. Kong is one of the most recognizable brands of chew toys in the market today. Founder Joe Markham came up with the idea for Kong rubber toys as a way to discourage his own dog, Fritz, from chewing on harmful and dangerous items. Rubber Kong toys are durable, washable, and come in a wide range of shapes and sizes. Kong has a product to meet the needs of any dog. We constructed a quick list that would make the best Pitbull toys from Kong. Kong Extreme is the classic Kong shape, but with improved durability for power chewers. The three-tier Kong shape allows unpredictable bouncing for interactive play. And the hollow interior is great for stuffing with a wide choice of treats and snacks to keep your dog’s attention. This toy also comes in a variety of sizes, so be sure to select the right one for your Pitbull! 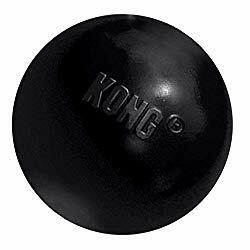 There’s also a Kong Extreme Ball! Made from the same durable Kong rubber, this toy takes the time-honored ball shape beloved to pooches throughout the ages. 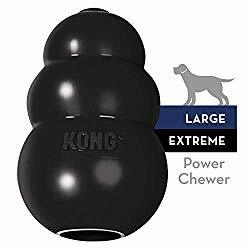 Perfect for chewing or playing, the Kong rubber ball can do it all. Stuff it full of a snack or start tossing for a play session, this toy is a guaranteed must-have for Pitbull toys and accessories. When it comes to Pitbull chew toys, the Kong Tires Extreme is the answer to many pet owners prayers. 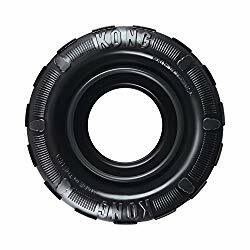 Super durable rubber gives this toy the same Kong toughness, while the tire design makes it fun for both chewing and games of all sorts. If you are looking for Pitbull proof dog toys, the Kong Rubber Flyer is a great choice. 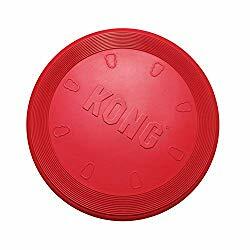 Tough Kong rubber and a classic flying disc shape create the perfect toy for Pitbulls who love to chase and fetch. Strong enough to stand up to wear and tear, this toy may not be designed for active chewing, but definitely has its place in the toy box. Creating durable dog toys since 1997, Planet Dog is the creator of the well known Orbee balls, bones, and toys. All made in the USA, Planet Dog offers a wide variety of toys that range from durable chewers to interactive puzzle and treat toys. Their toys vary in durability and style. Here are a few of the ones we would recommend as Pitbull proof toys. Made in the USA, non-toxic, BPA and phthalate free, this FDA approved ball bounces, floats, and even freshens breath! Available in classic silver, striking orange, or stylish purple, this ball is a guaranteed winner. Just like our previous entry from Planet Dog the Orbee-Tuff Orbee Bone comes with the same promise of a non-toxic, BPA and phthalate free chew bone. It also is recyclable and dishwasher safe. You can also choose from multiple sizes and colors including blue, green, pink, and even glow in the dark for those who like an evening stroll with their pup. Part of a sports-themed series of toys, this Planet Dog soccer ball toy is made for larger dogs to play safely with. Other fun sport style toys in this line appropriate for a Pitbulls include footballs and basketballs! Remember, no toy is truly indestructible. Some dogs destroy toys instantly, while others will play with the same toy for months with little to no lasting damage. Each dog is different and has different needs. Be aware of your individual dog’s habits and preferences, and seek out the toys that are the best match. Never leave your dog unattended with any new toy. Always supervise your dog, and take away any toy when it begins to be compromised. Be sure your dog is given a size appropriate toy. A larger dog with a toy designed for a small mouth is more likely to tear off pieces or swallow a whole toy. Toys not approved for consumption can be toxic, and intestinal and tracheal blockages can quickly become fatal. Be aware and use your best judgment on what toys are a good choice for your Pitbull. Don’t hesitate to ask your veterinarian for recommendations and advice on choosing the best toys. There is no substitute for professional medical advice. Just remember, have fun and stay safe! 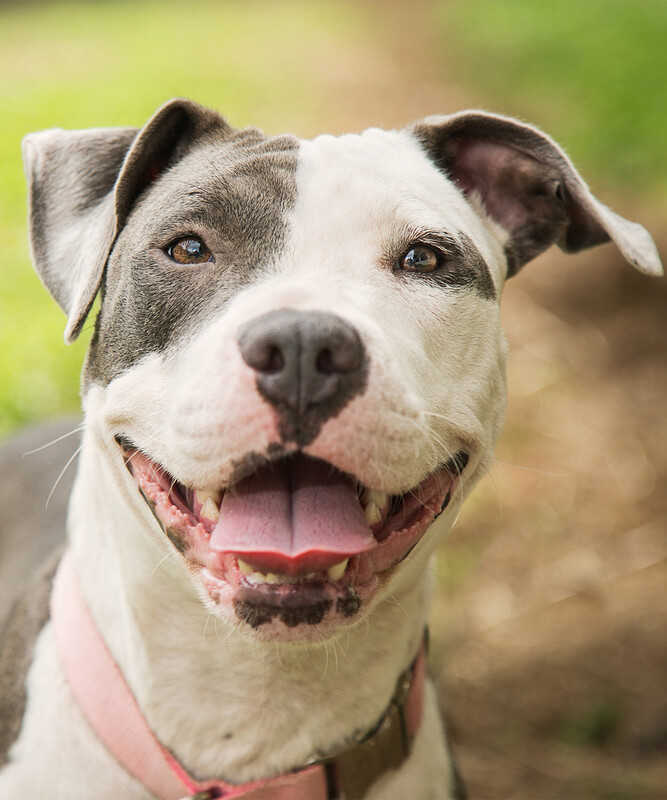 And if you’re a Pitbull lover, check out our article on Blue Nose Pitbulls! Bekoff M. 1974. Social Play in Coyotes, Wolves, and Dogs. BioScience. Wells DL. 2004. The influence of toys on the behaviour and welfare of kennelled dogs. Animal Welfare. Harvey CE. 1996. Correlation of diet, other chewing activities and periodontal disease in North American client-owned dogs. Journal of Veterinary Dentistry. Seksel K. 2008. Preventing Behavior Problems in Puppies and Kittens. Veterinary Clinics of North America: Small Animal Practice.